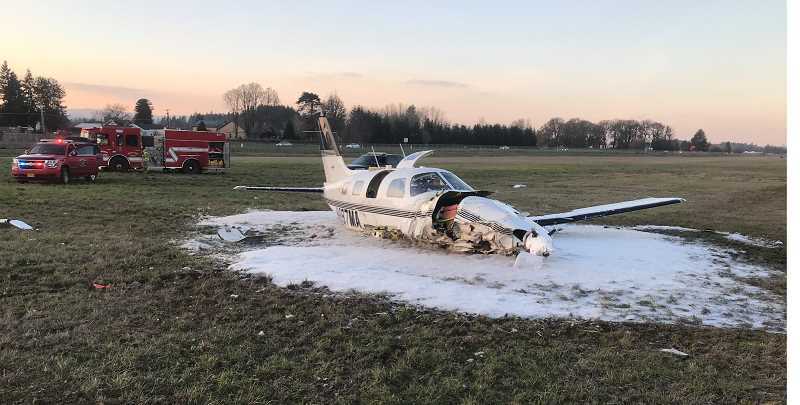 At approximately 3:35 p.m. Wednesday, Feb. 6, Aurora Fire District was dispatched to a reported airplane crash at the Aurora State airport. First arriving units found a single engine Piper south of the runway and on airport property. There were two people on board, the pilot and a passenger. The pilot was able to extricate himself from the aircraft prior to the arrival of first responders. The passenger needed to be extricated from the aircraft by firefighters. Both occupants were conscious and aware of their surroundings. The two men were transported to Salem Hospital for treatment. According to witness accounts, the aircraft was inbound for landing when the aircraft came into contact with radio transmitters in the south end of the field. There were no injuries on the ground and the crash is under investigation by the FAA. Aurora Fire was assisted by TVF&R, Canby Fire, Marion County Sheriff and Oregon State Police.